Free Co-Op Playgroup for birth-3 year old children that meets Wednesday mornings (9:30-11:00) at Blakely Hall. The Issaquah Highland Co-op Playgroup is now on Facebook. Come find us at here and find out about all of the fun we are having. After a casual summer of meetings in the park, Issaquah Highlands Playgroup is in full swing this fall at our new time, Wednesdays from 9:30 - 11:00. Each week we have a different theme for our story time and craft. We continue to do our song time and parachute activities as usual. Please come by and check it out! 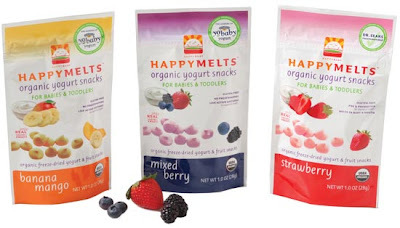 The Issaquah Highlands Playgroup sends out a big THANK YOU to Happy Baby Organic Baby Food for donating all of the tasty snacks for playgroup. They are a big hit with the kiddos! HAPPYFAMILY is the nation's premier maker of organic snacks and food for infants-preschoolers. HAPPYFAMILY strives to fuel children's growing bodies with the best-tasting, nutrient-dense meals and snacks possible. All products are certified organic, kosher, and all packaging is BPA and chlorine free. Additionally, several snack/food options are gluten-free, have added DHA, pre/probiotics and whole grains such as Salba. With nearly 40 different product and flavor options, there’s surely something to please everyone! We are making some changes to the Issaquah Highlands Playgroup and after over a year at the firestation, have moved back to the side meeting room at Blakely Hall. This room is a little larger to better accomodate our growing group! For the next two weeks (Dec. 22rd & 30th), the Issaquah Highlands Playgroup will be cancelled for the holiday. We will pick back up on January 6th. Looking forward to seeing everyone then! The Issaquah Highlands Playgroup has decided to make a few new changes this fall after a very relaxed summer schedule to provide the children a little more structure and learning opportunity. Each Thursday when we meet we will keep to the following schedule. Each mom can volunteer for a week and theme then provide the craft, snack and book for that session. In addition, we will still have free play mats for children who are too young to participate in some of the activities. If you are interested in receiving e-mails and information on the Issaquah Highlands Playgroup, please sign up for the playgroup's Google Group at http://groups.google.com/group/ihplaygroup. This is a different account from the previous yahoo group that we used. Playgroup has had a slow Summer!! The Issaquah Highland's playgroup is still meeting on Thursday mornings from 9:30 - 11:00 at the fire station. We hope to have our Tuesday morning time slot back in the fall, but currently play time is very casual. With the warm weather, vacations schedules and parents staying home with school age children the attendance is down, but it is still a fun place for the kids to play and interact with one another. We look forward to having new members join the group, so please come and check it out!